COST SAVVY: Iona Lawrence with some of the food she lived on for £5. A woman defied hunger pains to live on just £1 a day for five days in a bid to raise awareness of starving children across the world. 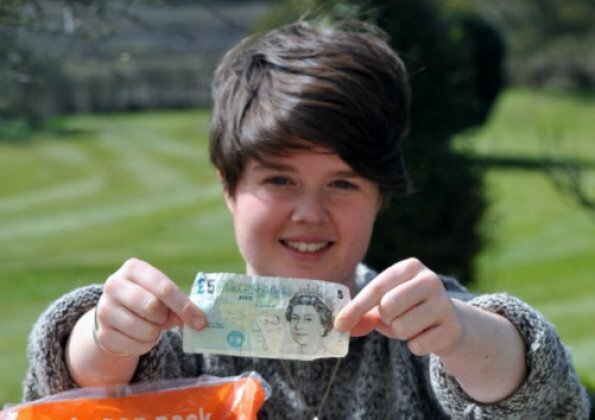 Iona Lawrence, from Kettlebaston, set herself the challenge of spending five days living below the poverty line on just £5. The 24-year-old took up the stomach-rumbling task of surviving on food and drink costing less than £1 a day to support the work of Save the Children. "No child should die because they can't get enough to eat," said Iona. "By taking part in this challenge, I hope I have put a spotlight on the 1.4billion people who live below the poverty line. Yet for them, their £1 a day has to cover everything." Starting last Monday, Iona radically altered her shopping list and scoured the shelves for anything that was cheap and filling. Having completed the challenge 12 months ago and learnt a few lessons, she stuck to tinned tomatoes, potatoes, rice and pasta. "Last year, I just boiled some lentils and ate them through the week, but as I couldn't afford seasoning, much of the food was horrible," said Iona, a former chef. "This time, my luxury was a courgette." But it wasn't just terrible tasting food she needed to endure. "It affected my productivity and social plans as I had no energy or inclination to see friends," said Iona. "It makes you think about what you really need as so many children face these restrictions."